Let the Word of God be your constant companion You want a conveniently sized Bible, but you also want to read the print comfortably. This edition gives you both--and extra features. Slip this handy Bible into your purse or pocket for boosts of inspiration and strength throughout the day! The New American Standard Bible Thinline edition is sized just right for briefcase, purse, or coat pocket, yet the large print reads as easily as bigger, heavier, stay-at-home Bibles. The sleek styling and affordability of this Bible make it a perfect traveling companion. Take it with you wherever you go. The NASB represents a conservative, literal approach to translation. More than 20 translators and conservative Bible scholars, representing a variety of denominational backgrounds, spent nearly three years completing the project. The team carefully adhered to the principles of literal translation and made no attempt to interpret Scripture through translation. The original NASB was complete in 1971. The 1995 edition made several updates. ;Words that have changed meaning have been updated; the archaic pronouns "Thee" and "Thou" have been eliminated in reference to Deity; verbs that have a wide range of meaning have been retranslated to better account for their use in the context; punctuation and paragraphing have been formatted to today's standards; and notes about the ancient manuscripts have been revised to include more new and interesting facts. Easy on the eyes for people on the go It's a small Bible with large print! When you want to take the Bible with you, the NASB Thinline Bible Large Print edition travels along wherever you go. This 1995 NASB full-text Bible fits easily into your pocket or purse, yet has a clean, readable 10.1-point large print type that's easy on the eyes. Features include 8 pages of full-color maps, a concordance, and a double-column format. Special study helps like "Perspectives from the Bible," "Ministry, Teachings, Miracles, and Parables of Jesus," and "Promises from the Bible" offer information for greater understanding in your reading. ;The updated New American Standard Bible is an affordable alternative to take with you wherever you travel, slipping easily into suitcase, pocket, or purse without weighing you down. NASB Thinline Bible: Hardback, Large Print by Zondervan was published by Zondervan in March 1999 and is our 11731st best seller. 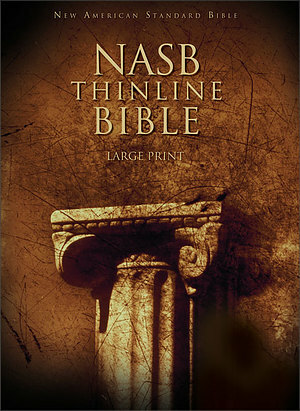 The ISBN for NASB Thinline Bible: Hardback, Large Print is 9780310917960. Be the first to review NASB Thinline Bible: Hardback, Large Print! Got a question? No problem! Just click here to ask us about NASB Thinline Bible: Hardback, Large Print. A:This Bible's size, in inches, is as follows: Height - 9.63 Width - 6.63 Thank you for using the Q&A Forum.